The Trump administration will reportedly move this week to rescind an Obama administration waiver that has allowed California to set its own vehicle fuel economy standards. The move, Bloomberg reported Monday, has been rumored to be in the works for nearly a week. Clean Technica called the move a “declaration of war” by President Trump against the sixteen states and the District of Columbia that agreed to follow the regulatory regime adopted by the California Air Resources Board after receiving its 2009 Environmental Protection Agency exemption. Since rumors of the action by the Trump administration stated circling on July 18, the market capitalization of electric car leader Tesla, Inc. has fallen by about $4.7 billion. Then-Republican Governor Arnold Schwarzenegger’s was denied an EPA exemption to regulate greenhouse gasses in 2007 by the George W. Bush administration. But in the first week after his inauguration in January 2009, President Barack Obama’a administration approved the California Greenhouse Gas Waiver, which allowed the state to implement any proposed emission standards. The California Air Resources Board (CARB) has since requested and received approval for over 50 waivers to adopt stricter emission standards. In addition, Connecticut, Maine, Maryland, Massachusetts, New Jersey, New York, Oregon, Rhode Island, and Vermont subsequently joined California in adopting mandatory zero emission vehicle (ZEV) quotas in 2011, according to Automotive News. Faced with a coalition representing 28 percent of new-car registrations, auto manufacturers were forced to agree to CARB’s Advanced Clean Cars standards for all-electric and plug-in hybrid vehicles. But beginning in 2018, major auto manufacturers must sell a minimum of 4.5 percent ZEVs, including at least 2 percent all-electric vehicles. That ratio grows to 22 percent with at least 16 all-electric by 2025, according to the Reason Foundation. Despite huge investment plans by U.S. automakers, including $11 billion by Ford to offer 40 hybrid or all-electric vehicles globally by 2022, U.S. ZEVs represented only 1.15 percent of U.S. vehicle consumer sales in 2017, according to Forbes. Electric powertrains could someday become the standard for autonomous ride-hailing fleets in major metropolitan areas. But the auto industry has not seen a 2018 surge in U.S. electric sales, despite gasoline prices spiking up to almost $4 a gallon in California. Breitbart News reported last month that the Howard Jarvis Taxpayers Association’s “Repeal the Gas Tax” initiative easily qualified for the November statewide ballot. The proposition would repeal Senate Bill 1 of 2017, which raised the tax on gasoline by 12 cents per gallon and 20 cents per gallon for diesel, while also increasing vehicle registration fees. 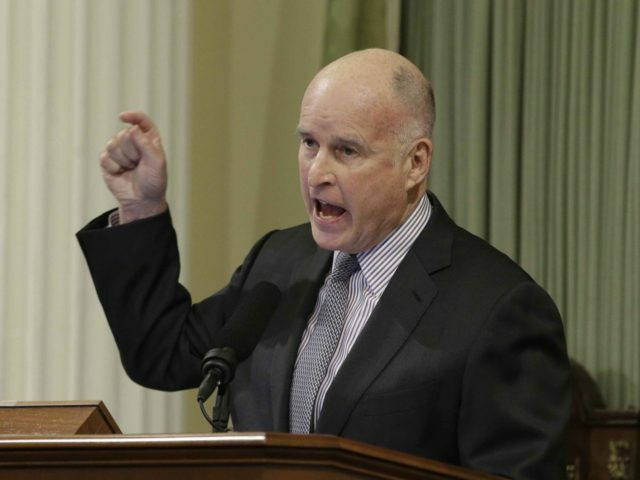 It is unclear just how much money California would lose from the termination of the EPA waiver, but Governor’s Jerry Brown’s budget for Fiscal Year 2017-18 included an estimate of $2.2 billion in revenue from funding from the Greenhouse Gas Reduction Fund.